In Bali, restaurants with a unique concept are spread across the entire island, but there’s not many of them that serve legitimately great dishes. Make your way to L’Assiette Restaurant Bali, an extraordinary French restaurant located at the heart of Seminyak, and you’ll see why it is not one of them. Once you step into the place, you’ll see how the interior is beautifully decorated with the style of French colonial with a touch of Bohemian vibe. 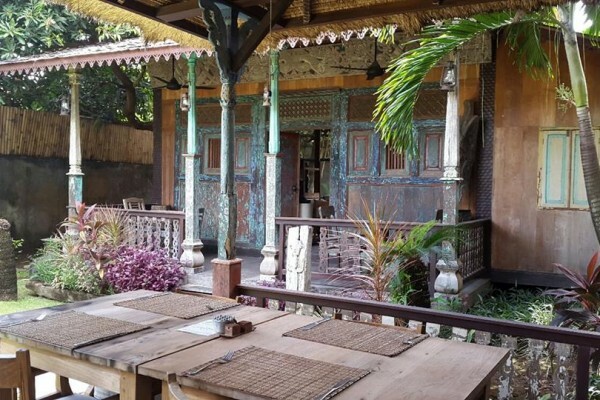 There is a small garden at the backyard, where you can find Javanese-style wooden houses as the gazebos. The cozy atmosphere will make you feel homey and dreamy at the same time. French home cooking served in an antique and homey Indonesian venue? First impression well made. …But what about the food? Don’t worry. They’ve got you. You know that most of the time, French cooking is served in an upscale and extravagant technique. The portions are mostly unsatisfying. Here at L’Assiette, you can indulge in an extensive selection of delightful French home cooking, and most of them are significantly inspired by the world’s famous Georges Blanc, a three-Michelin-star French chef. And the best thing? Most of the ingredients and appliances are brought exclusively from France, so you can totally taste the authenticity and realness of the French flavors in their dishes. Delicieux! Need recommendations? For lunch, I would recommend Beef Carpaccio (Rp. 95.000), served with salad and french fries. Juicy and tender, this one will surely keep you wanting for more and more. They have LUNCH SPECIALS daily! They usually come in a 3-course meal set menu at Rp. 90.000 nett! For example, one lunch set menu would include Tabouleh Salad, Pasta Tempura, and Chocolate Mousse. Simple, satisfying, and reasonable. For dinner, you would wanna try their Pork Ribs (Rp. 80.000), crispy on the outside, tender on the inside! Aaaand, of course, their one and only Home Made Duck Confit (Rp. 175.000). Fresh, delicate, and so flavorful. I guarantee that you can’t find this authentic delicacy anywhere else. Don’t leave just yet after your mouthwatering dinner, you must try their refreshing selection of cocktails! They also offer a various selection of wine from all over the world. Accompanied with soft French melodies, glasses of delicate wine, your French dinner at L’Assiette will surely be one of the memorable ones you’ll ever experience. The post L’Assiette Bali: Your Home Sweet Home In Paradise appeared first on Qraved Journal.